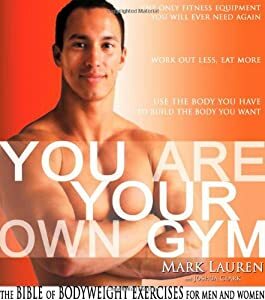 You Are Your Own Gym by Mark Lauren, is a great reference book. No need for me to reinvent the wheel. He has said it all: Why Bodyweight Exercises, Why Strength Training (or Why Cardio Is a Waste of Your Time), Back to Basics Nutrition, Myths, Motivation and Intensity. These are very short, straight to the point essays so you won’t spend hours reviewing the information. The rest of the book is filled with bodyweight exercise descriptions including photographs. Mark Lauren is a certified Military Training Specialist among other qualifications. He knows first hand the necessity for soldiers to be in optimal shape for physically demanding missions. From solid research and experience he has successfully designed short workouts that support his cause. His book makes these strategies accessible for all of us. If you find the books’ practical content a little over your head, you can follow my 4 Minute Mornings’ progressions which will establish a great foundation for strength and flexibility. My hope is that you will graduate from these progressions feeling confident to tackle any workout program. Remember, just about anyone can do these exercises; there’s really nothing to it. Consistency is the real challenge. If you keep your exercise sessions short you are more likely to practice regularly. Read You Are Your Own Gym. Arm yourself with the information and put it into practice. The following are my two favourite bits of research perfectly condensed and described by Mark Lauren. “Izumi Tabata and his partners at the National Institute of Fitness and Sports in Tokyo, Japan, compared the effects of moderate-intensity endurance and High-Intensity Interval Training on maximal aerobic capacity—the best indicator of cardiorespiratory endurance. They conducted a six week study with two groups of randomly picked males. minutes of Interval Training five days a week. “Dr. Angelo Tremblay and his colleagues at the Physical Activities Sciences Laboratory, in Quebec, Canada, tested the popular belief that low-intensity, long-duration exercise is the most effective program for losing fat. They compared the impact of moderate-intensity aerobic exercise and High-Intensity Interval Training on fat loss. Skinfold measurements revealed that the Interval Training group lost more body fat. Moreover, when they took into account the fact that the Interval Training burned less calories during the workouts, the fat loss was 9 times more efficient in that program than in the aerobics program. Wow, that was so interesting!